The first meeting of the Orrville Area Safety Council (OASC) for 2019 provided over 80 attendees with new ideas and resources to help them advocate health and safety practices in their workplace. A Health and Safety Fair was held in place of the OASC’s regular monthly meeting at The University of Akron Wayne College on January 9. Twelve local vendors participated by educating attendees with a quick tip related to their area of expertise while showcasing the services they provide for employers. Afassco, manufacturer of first aid, medical and pharmaceutical supplies, provided a fully stocked first aid kit as a door prize. 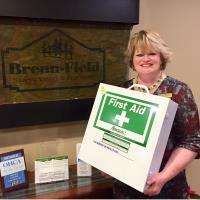 Violet Kahrig, Brenn-Field Nursing Center was the lucky winner. Other door prize winners included: Ana Gerber, Gerber Lumber, won a fitness tracker donated by The Wayne County Health Department, Jolene Howard, Deco-Crete Supply, won a Flex Band donated by Better Life Flex and Stretch and Jan Hilty, 3-D Meats won a tool box donated by Affinity Partners. Aultman Sports and Wellness donated water bottles and travel mugs that will be presented to the winners at the February Safety Council meeting. The Orrville Area Safety Council is a partnership between the Orrville Area Chamber of Commerce and the Ohio Bureau of Workers Compensation. Lunch and Learn meetings are held the second Wednesday of each month at The University of Akron Wayne College in the Student Life Building. The February 13 meeting will be presented by Ohio Health and Administration (OSHA). To register to attend visit www.orrvillechamber.com or call the Orrville Area Chamber at 330-682-8881.